As this will be my last Valentine bento for the year, I thought I'd try a little something I hadn't done yet. This is my first attempt of cutting baby carrots and assembling them into heart shapes. I have seen so many ideas using grape tomatoes, sausages, grapes, etc and thought I'd give it a try with carrots. I found it's not as difficult as I had thought. Have a fantastic weekend and have a Happy Valentine's Day! Main compartment - Heart shaped sandwich with strawberry jam filling seen through smaller heart shaped cutout which makes the 'Love' in the 'I Love U', the lettering is colby cheese. Lower left - Heart shaped baby carrots and broccoli florets. Center - Heart shaped cantaloupe. Upper right - Seedless green grapes, cantaloupe hearts and a cute pick. 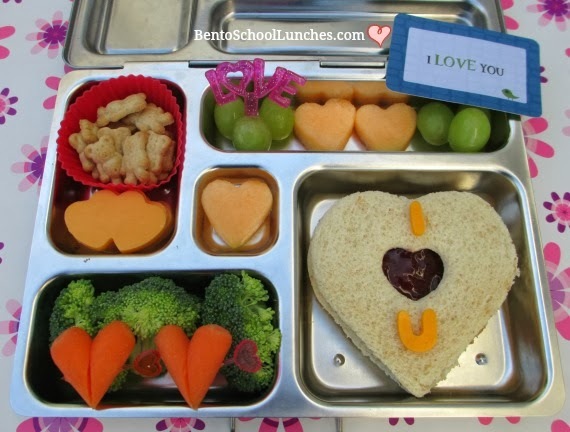 This lunch is packed in a Planetbox rover with a Lunchbox love note. So sweet! Happy Valentines Day Rina! Lovely lunch! Happy Valentine's Day, Rina!